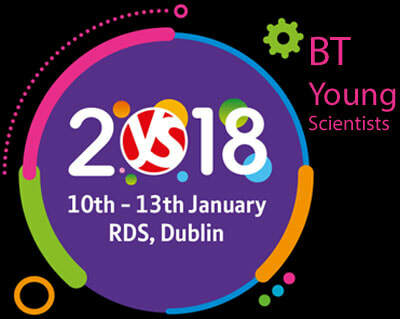 ​Two Transition Year groups from the school will compete in the BT Young Scientist competition between on 10th-13th January at the RDS in Dublin. James Fields, Daniel Walsh and Liam Moore's project is investigating the effect of a foam rolling program on sprint speed in young adult males. 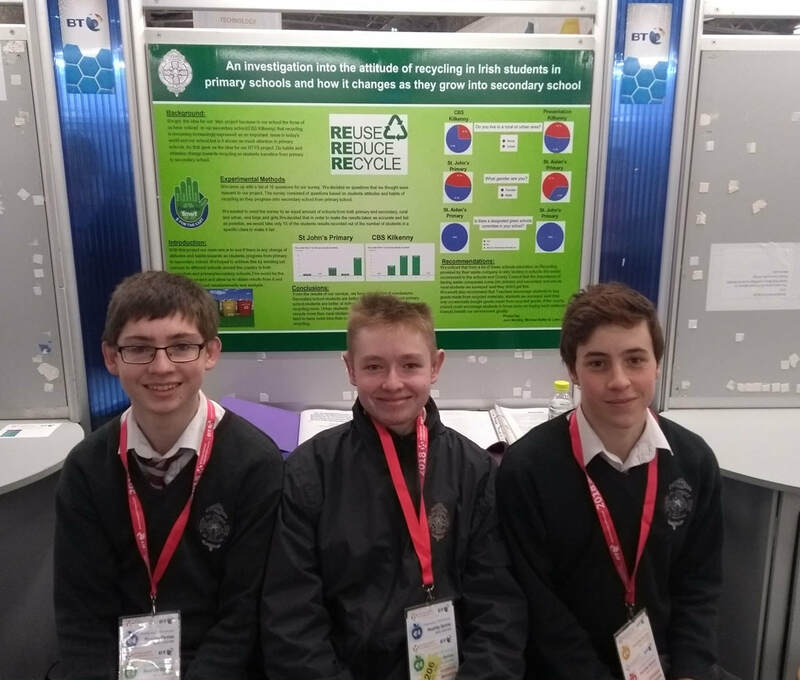 Meanwhile, Michael Rafter, James Murphy and Luke Cullen are investigating attitudes towards recycling in primary and secondary schools in both rural and urban backgrounds. 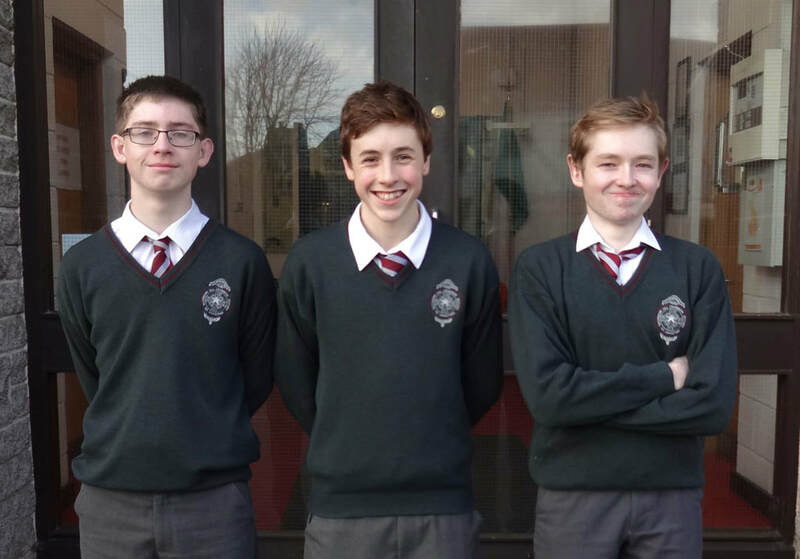 Both groups have shown a great attitude and commitment to their projects and we wish them and their teachers Mr Teehan , the very best of luck in the competition in January. 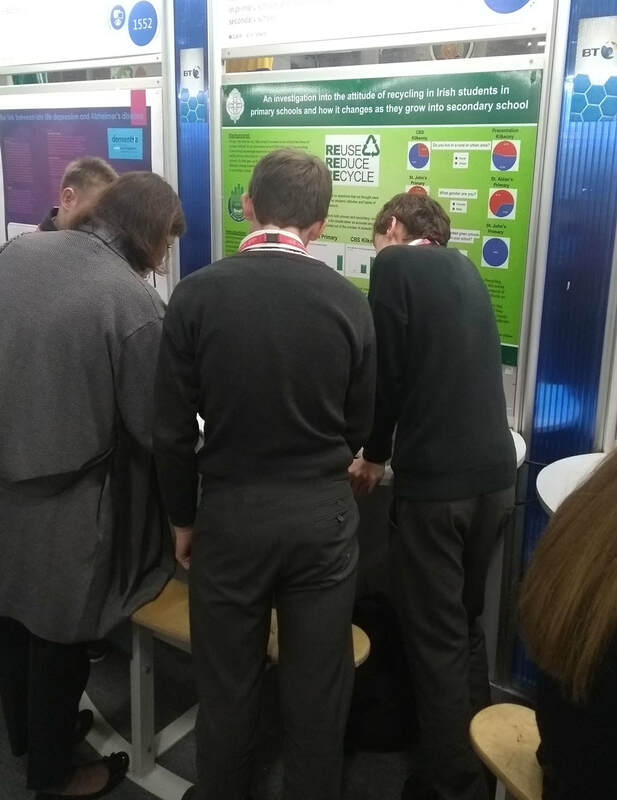 The BT Young Scientist and Technology Exhibition was held in the RDS from the 11th to 13th of January. My project was titled ‘The Effect of Foam Rolling on Sprint Speed on Active Male Teenagers’ and I entered as part of a group. The exhibition had 550 projects on display. We got 3 judges who all told us that we had done an interesting project and they hope we will continue on with our research. The exhibition opened to the public on Thursday. It was great to see so much people come up to our stand and ask us questions. While we were nervous about the first few questions from the public, they all commended us on the presentation of our project and the information we gave them. ​We had a great time and the evening entertainment was fun and sociable. I really enjoyed talking to the public and the group beside us because they were a right laugh. Overall, I had a great time and got to see so many great projects and future scientists. It was worthwhile and I would love to do it all again. I also want to recommend students to enter while they have the chance. I took part in the BT Young Scientist Exhibition 2018. Our project was based around the recycling habits of students in primary schools and how their attitudes change as they progress onto secondary school. I really enjoyed the overall experience, I learned new things about myself that I never knew and I gained new skills, such as confidence in presenting to Judges and the public about our project. I met new people and made new friends. We met TDs John Paul Phelan and Bobby Aylward and got invited to Eco UNESCO where we will present our project. I was honored to attend the event as only 25% of entries get into the event, Unfortunately we did not win this year but I plan on entering the event in 2019 to do something bigger than anything I've ever done in my life or maybe in the entire competition. The BT has done so much for me and I am grateful for it. My experience of the BT Young Scientists was great. It was very beneficial and rewarding for me. I really enjoyed the few days up at the BT Young Scientist . We got great feedback and the judges were very impressed with our idea and the research we did. 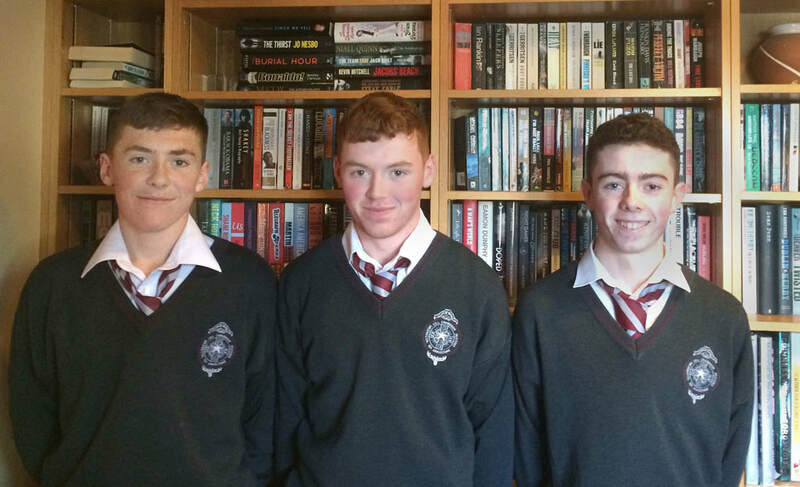 I entered the BT Young Scientist as a group with Liam Moore and Daniel Walsh. Our project is "The Effect of Foam Rolling on Sprint Speed". We started the project in September. We took on the project together because we all have an interest in sports and therefore felt that sports science would suit us best. The project was very time consuming and included a lot of hard work. However, it was a very beneficial experience as I developed new skills and also we were invited to UL in May to present our project. The exhibition was the highlight of my experience. I got a great sense of accomplishment out of being able to present my project after all the work I had done. It was also very social. We had plenty of time through out the day and during the evening entertainment to speak to the other students and everyone was very friendly. I would recommend to everybody to enter the BTYSE as there are plenty of areas to base a project around, depending on your interests and it is a great social event. The BT Young Scientist and Technology Exhibition was an exiting and amazing experience that showed me the opportunities that science subjects can offer. It was was a really fun and entertaining event and I enjoyed every minute of it. 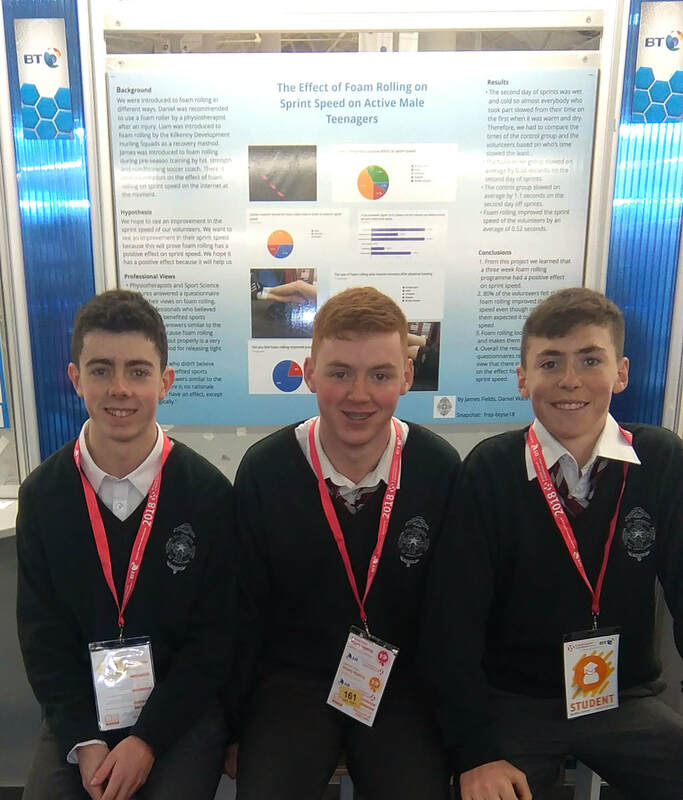 My teammates Michael Rafter, Jack Murphy and I travelled to the RDS in Dublin to compete and present our project -the attitudes towards recycling of secondary school students and how their attitudes change as they grow from primary to secondary school. The whole experience of the BTYS was very enjoyable. Both the opening and closing ceremonies were very interesting and fun. 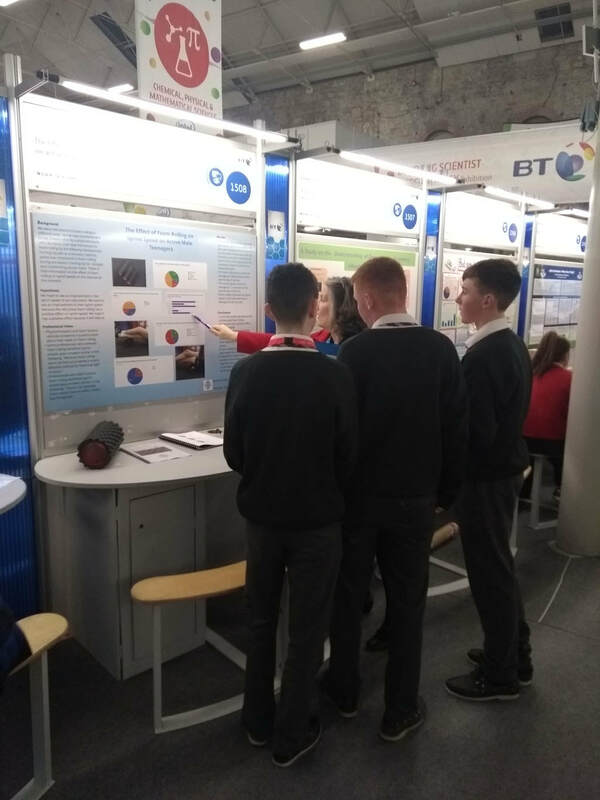 It was very nice to have members of the public, TDs from Kilkenny, interviewers, judges and peers come and ask us questions about our project. The whole event was extremely enjoyable and one I won’t forget for a while.